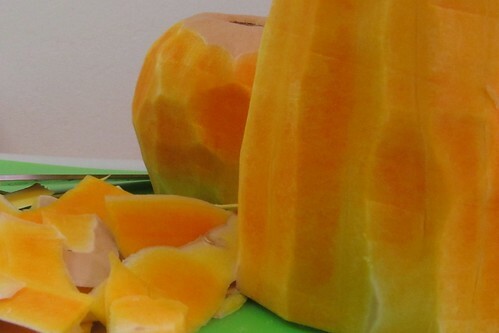 Crock pot butternut squash curry – and how to cut up a butternut squash. 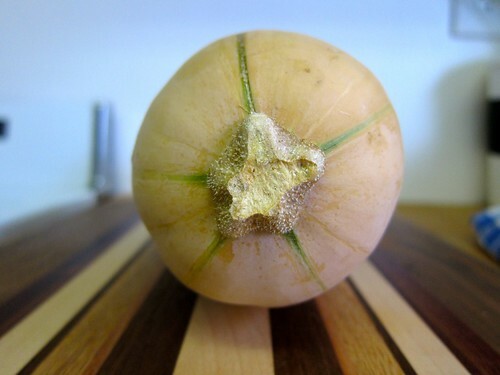 I used to fear these gourds. I didn’t have nightmares about them or anything, but I had no Idea where to start. When I got one in my farm box I knew the time had come to face my fear. Luckily they keep for a good long time because I stared at it on the counter for a couple of weeks. I knew I liked butternut squash in soup and ravioli. But I’d always had it at restaurants or from the chef at work. I didn’t know how to get to the orange-y cubes of goodness. I had to stop her there. That was the problem: “how do I cut it in half?” To get equal halves I would need to cut it lengthwise, right? But that seemed scary. I could just see myself slipping with the knife and cutting my fingers in half along with the squash. Or having it slip out from under the knife and fly across the room while I land face first into the blade. You see why I was scared of the thing. It was trying to maim me! But Chef Susan said “No.” She said that she would cut it right at its waist, before it starts to bulb out. After I did that, she told me it would be easier to peel. After I peeled it, then I halved it again. This time lengthwise and scooped the seeds and gunk. 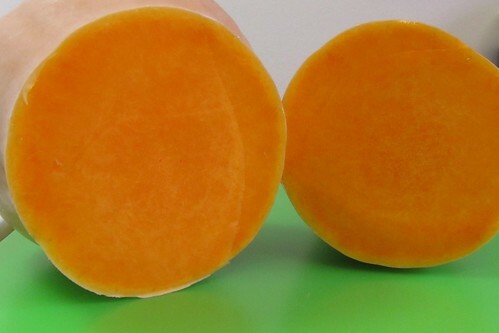 After that it easily cut in the pretty cubes like in the above picture. And there was no slipping or maiming or blood. Bonus! Cut up it was put into the crock pot with some tomatoes, onions, carrots, garbanzo beans and curry spices. I left it to cook for 7 hours on low, stirred, then spooned it over couscous. It turned out to be a hearty meatless meal. 1 white onion halved and sliced. 2 (15 oz) cans garbanzo beans, rinsed and drained. 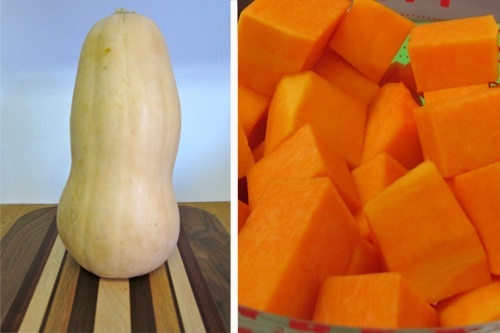 Place butternut squash in a 4-quart electric slow cooker. 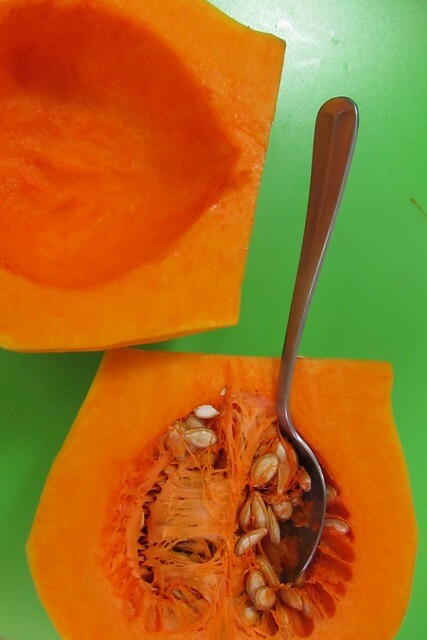 Mix remaining ingredients (through garlic) in a bowl and spoon over squash. Cover with lid and cook on low setting for 7 hours. You could stir in cilantro at the end or top with plain yogurt if you have it. 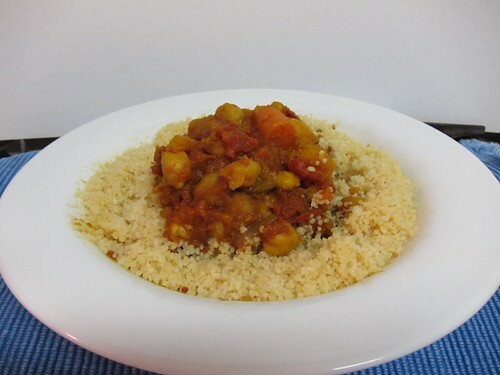 Serve over hot cooked couscous. If you’d like it with more kick (depending on how hot your curry powder) you can add 1/4 tsp or more of cayenne pepper. Love the recipe and the cutting up hints! And the photos……ridiculously beautiful! thank you! Yummy! Sounds so good! I just made butternut squash soup last week, but this curry recipe sounds deeeelish! Thanks for sharing.